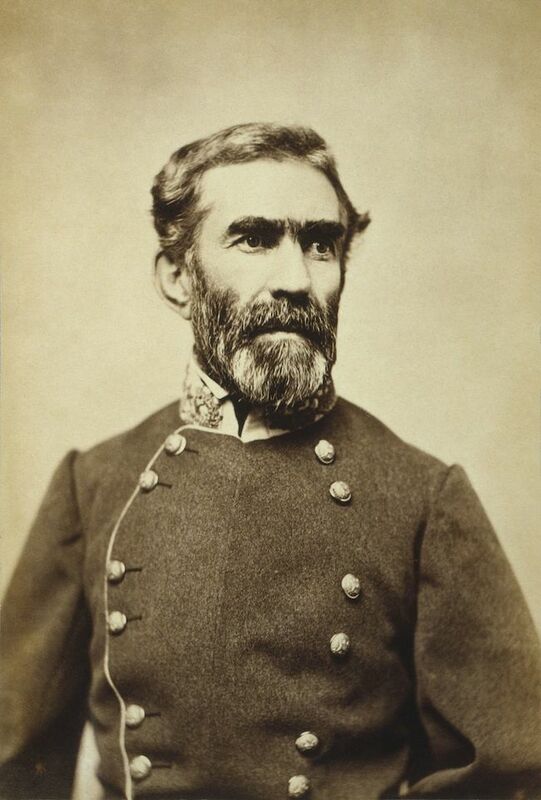 Braxton Bragg was an Army guy. Career Army. He was also a Confederate General responsible for the western campaign of the American Civil War. But he was mostly a sour puss who easily blamed others. It takes a special kind of disagreeableness to disagree with yourself. Bragg was a world-class disagreeable fellow though. Even Bragg’s staunchest supporters admonished him for his quick temper, general irritability, and tendency to wound innocent men with barbs thrown during his frequent fits of anger. His reluctance to praise or flatter was exceeded, we are told, only by the tenacity with which, once formed, he clung to an adverse impression of a subordinate. For such officers—and they were many in the Army of the Mississippi—Bragg’s removal or their transfer were the only alternatives to an unbearable existence. History shows that Jefferson Davis couldn’t get along with him. It seemed nobody could get along with Bragg. He remained in positions of responsibility due to the shallow depth of talent to replace him. After the Civil War he jumped from one endeavor to another. Each one seemed to end with a common refrain. Bragg would get into a disagreement with others and that would end the endeavor. He dropped dead in Galveston, Texas at the age of 59. I wonder how many people were pleased at the news. Surliness isn’t the exclusive domain of Generals or big bosses. Their tyranny can be especially disconcerting because of their power. But what about the disagreeable employee? Can anything be done to help them? Should anything – short of termination – be done? The reason for being disagreeable is moot. Nobody cares. Whatever burr that may have caused Bragg’s saddle soreness was of no concern to anybody. The truth is, the man was a class A felon when it came to being disagreeable. Why is anybody’s guess. His own men tried to kill him. I doubt they sat around the campfire wondering why their leader behaved so poorly. They simply wanted it to stop. Ditto for the disagreeable employee. I’m not talking about a person who is having a bad day. I’m talking about the chronic disagreeable employee. The employee who will argue about most anything. All the time. I’m talking about the employee who will behave poorly toward their boss and toward the team. Some disagreeable employees have been that way for as long as anybody can remember. People up and down the organization know them by their earned reputation. Like Bragg they’ve littered the trail of their career with disagreements. Can you help an employee like that? Maybe. Other employees turn disagreeable. Maybe they were overlooked for a promotion. Maybe they got a promotion. Something happened and now they’re disagreeable, or more disagreeable than ever before. What about them? Can they be helped? Again, maybe. Battling the disagreeable employee is easy when the employee is a marginal contributor. Most leaders will take swift action to rid themselves of the cantankerous employee who isn’t performing in the top tier. These are rather easy decisions. But what about the person who is skilled at their work and mostly performing at a high level? These are the employees who vex good leaders. But I’m going to encourage you to not remain vexed for too long because you’ve got to consider the negative impact of the disagreeable employee. So let’s start with why you must avoid giving way to the disagreeable employee. 1. The disagreeable employee will undermine your leadership. Your ability to properly lead your team hinges on one central behavior, willingness. This is the non-negotiable standard that must be maintained by any organization that expects to foster high performance. When you suffer the disagreeable employee, you’re telling your team that willingness isn’t mandatory. You demonstrate your own willingness to accept debate, controversy and confrontation on your decisions. One bad apple and all that. Order, decorum and performance will fail if the disagreeable employee remains…or if they remain disagreeable. 2. The disagreeable employee will wreck the performance of the team. Every employee needs to feel special in some way. That’s not possible in the presence of the disagreeable employee because they’re always hogging the spotlight. All eyes and ears are on them as people just wait to see how they’ll respond to your latest decision as a leader. Rarely will the disagreeable employee confess to being a glory hog, but they are the most selfish people on your team. Their opinion and their judgment matter more than anybody else’s. Including yours. The grind of dealing with the disagreeable employee will take a heavy toll on the rest of the team as they constantly work under duress of their own bad feelings toward their disagreeable teammate. Increasingly, they’ll feel as though they must meet a higher standard. Fairness will be lost, along with morale. 3. The disagreeable employee will eventually cost the leader. A leader will pay a heavy price for tolerating the disagreeable employee without attempting and succeeding in finding a remedy. It can come at the hands of consistently poor performance, resulting from a leader’s refusal to hold every employee accountable. It can come at the hands of superiors who tire of conflict not being properly handled. It can come at the resignation of valuable employees who simply can no longer tolerate the atmosphere and culture influenced by the disagreeable employee. Lots of things can go wrong when leaders refuse to deal with disagreeable employees. Circumstances can differ, but these general guidelines should serve to give you some sort of direction. a. Accept and assume responsibility. It may seem counter-intuitive for the leader to take on the responsibility for why the disagreeable employee is behaving poorly, but that’s where it must start. The truth is, the leader is tolerating it. Nothing can be improved until the leader refuses to let poor behavior continue. The parent who allows their teenager to talk back without any consequence has only themselves to blame. So it is with a boss who allows an employee to be chronically disagreeable. b. What’s done is done, but today it’s a new day. Just because a leader failed yesterday doesn’t mean she’s going to today. She can’t afford to keep failing so at some point a new day dawns. Some bosses feel it won’t work if they just show up tomorrow morning behaving differently. Here’s the key to it. If you’re the leader and you want to improve, then make up your mind that you’re going to start handling things better – including how you deal with the disagreeable employee. Stick with it. You’ll go wrong every time if you dive in, begin to deal with things, then slack off and revert back to your old ways. Avoid that. It’s not only possible, but it’s advisable that you draw a line in the dirt and take your stand sooner than later. Who cares what you tolerated yesterday? Who cares how you handled things yesterday? Today ain’t yesterday. You can stake your claim at any time anywhere. I’m encouraging you to do it today, right where you’re at. c. Sit down privately with the disagreeable employee to communicate your “new day” accountability. Apologize to them for failing to hold them accountable for their poor behavior. Reiterate to them the role you play to help them perform at their very best. Explain to them that their ongoing disagreeableness is destroying not only their performance, but it’s also impacting the performance of others. Tell them plainly, “This must stop.” Provide a couple (no more) of specific examples. Do not let them interrupt. Stay on course because these people are skilled at disagreeing. They will be true to their habit and nature. You can’t be sucked into an argument. This isn’t an argument. It’s a statement of fact based on their poor behavior and you’re the leader responsible to help them fix it by holding them accountable for it from now on. End this part of the conversation with, “Do you understand?” Don’t accept some rambling defensive arguing. Only a “yes” will do here. d. Let them out of the corner. I’m a father of two grown kids. I believe in spanking kids. No, not beating them. Spanking them. It’s not about inflicting physical pain. It’s about inflicting appropriate guilt so they’ll correct their poor behavior. One big reason I’m opposed – as a parent and grandparent – to “time out” is because it drags out the process and keeps kids in the corner literally. Through the years I’ve found that employees who feel they can’t get out of the doghouse with their boss, or they feel trapped in a corner of disapproval from which there’s no escape…well, they lose heart very quickly. A spanking demonstrates we’re not going to tolerate the poor behavior. It’s not harsh, but it’s timely. Quick even. Then it’s over. Corrective discipline has to end. It can’t go on and on else people will fail to recover and respond with appropriate higher performance. Encourage the disagreeable employee to correct their poor behavior. Let them know you believe in them and in their ability to do better. Assure them you’re going to serve them better by helping them. e. Start leading and managing better. Leaders don’t have to announce, “Things are gonna be different from now on.” I’m not a fan of that approach. Better to just start doing what you should. Begin it now and people will notice. You don’t need to write a memo or give a speech. Be prompt to correct all the poor behaviors. Let your actions speak louder than your words. There are no guarantees that this, or any other approach, will work with the disagreeable employee. Sometimes you just have to give them repeated opportunities and deal with their response to your correction. Avoid putting yourself in the position Bragg’s superiors often found themselves. Because they had no suitable replacement, they frequently tolerated his poor behavior. Find options and alternatives to the disagreeable employee in case they decide they’re going to remain unwilling to follow your leadership.